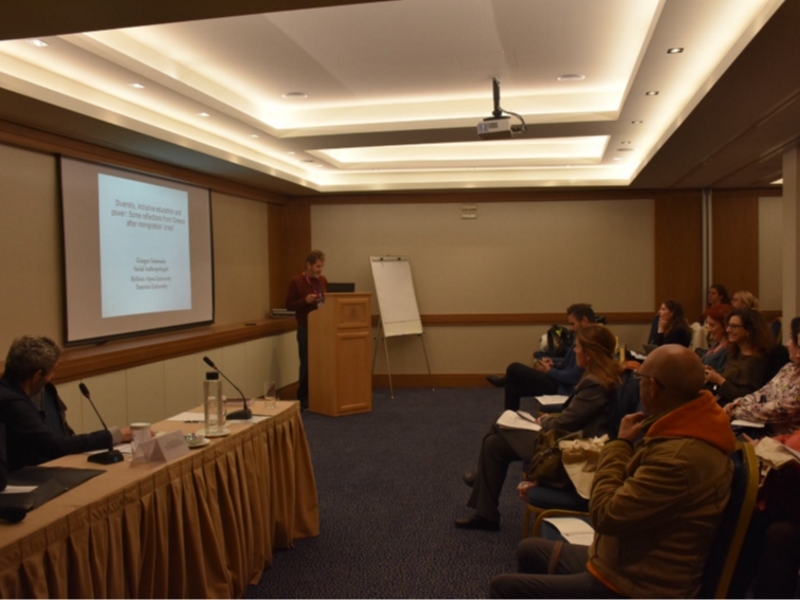 On the 12th and 13th December 2018, the International Conference on "Diversity in Adult Education: Community, Integration, Governance" (Electra Hotel, Athens) took place with great success. 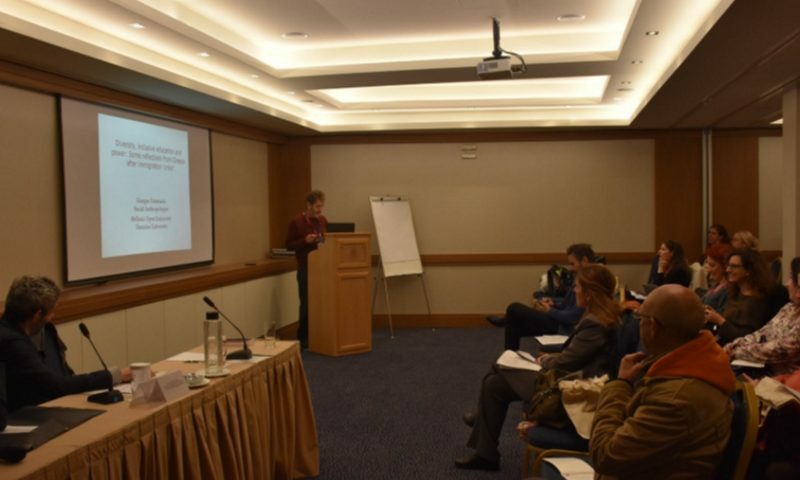 The conference was organized by the DAISSy Research Group of the Hellenic Open University (HOU) and the National Center for Social Research (EKKE). The conference marked the completion of the implementation of the European project entitled «DIVINA-EDU: Diversity in Adult Education». 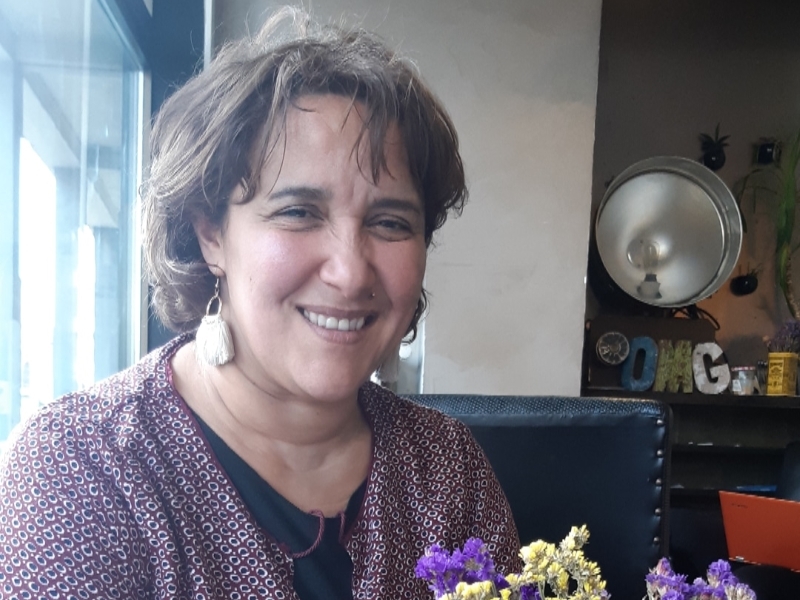 DIVINA-EDU project is funded by the Erasmus + / CA2 EU program and is coordinated by the Centro de Formación Somorrostro (Spain) with partners from Greece, Spain, Italy, Portugal, among which is the HOU-DAISSy Research Group. The project’s aim is to provide adult educators and administrative staff of adult education bodies with specific skills and tools, in order to be able to effectively manage the diversity among their learners. 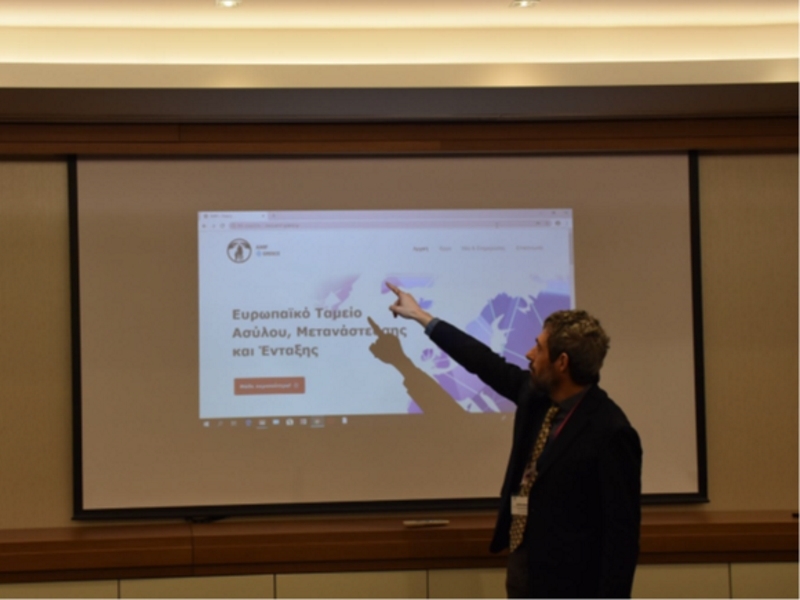 Dr. Achilles Kameas, Professor at the HOU, Director of DAISSy Research Group and Scientific Coordinator of DIVINA-EDU project, launched the conference and then a brief welcoming speech was addressed by Mr. Nikos Sarris, EKKE researcher. With particular interest, the participants attended sessions that discussed issues related to the genealogy of the term diversity and its relation to multiculturalism, to equality and diversity in the context of adult education, to the institutionalization of issues of diversity in its various aspects, and to the investigation of the consequences of such institutionalization in the Greek context. Furthermore, the phenomenon of multiple discrimination in Greece, and the inequalities it causes within the workplace were explored. Emphasis was also put on the relationship between adult education and diversity in terms of political planning and strategic interventions specifically developed for managing migration and refugee issues, as well as on the relationship in this context among education, employment and social inclusion. NGO’s important initiatives concerning communities or inter-communal partnerships that start from the principle of diversity and highlight prospects for innovation and dynamic social inclusion were also presented. It is noteworthy that at the initiative of the Director of the DAISSy-HOU Research Team, Professor Achilles Kameas, a special session was held, which included the first Greek AMIF cluster meeting (the initiative refers to the cluster of projects funded in Greece by the European Union’s Asylum, Migration and Integration Fund). The cluster involves five projects in total, adopting different methodologies (eg training, joint actions with the local population, art, etc.) and targeting different groups of the migrant and refugee population, as well as groups of the local population (eg. volunteers) with the aim to strengthen their engagement in the effective and respectful (according to their heterogeneity) integration of the above groups. 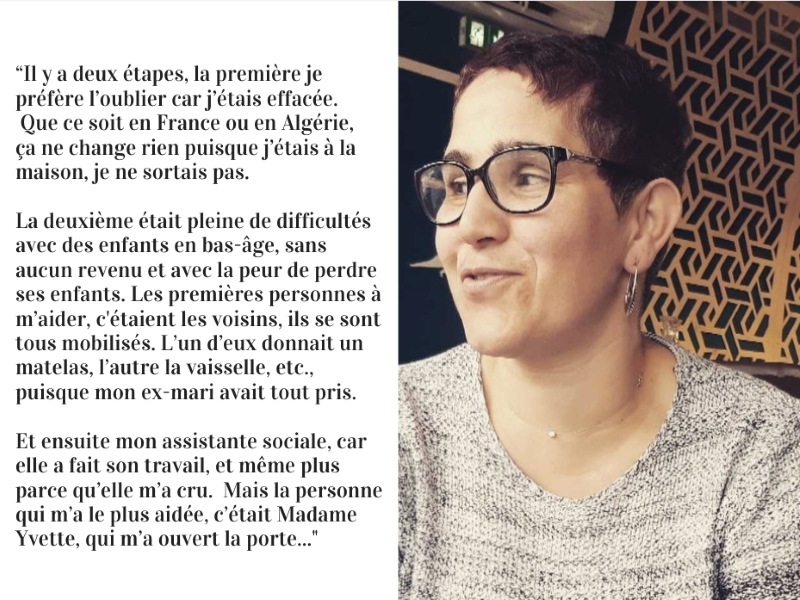 This session gave the opportunity to present the project "WEMIN Migrant Women Empowerment and Integration" (implemented by Coordinator of the DAISSy-Research Group) in detail and as a good practice for improving the integration of MRW through the enhancement of cultural awareness and exchange. 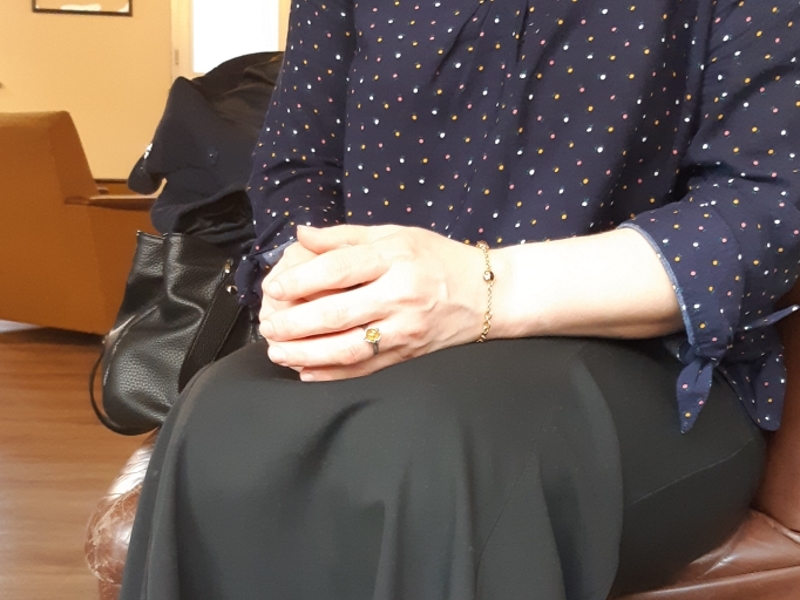 Professor A. Kameas referred in detail to the various types of interventions that will be implemented in the context of the WEMIN project and urged the participants to consider adapting the WEMIN model to their local communities. The WEMIN brochures were distributed to all participants who exploited the opportunity to exchange ideas and practices on diversity, education, integration and inclusion, discuss the benefits of the actions and the obstacles they face, and create synergies to address them. In conclusion, the conference was very successful, attracting more than 95 participants and gaining significant visibility. Representatives of public administrations and local authorities, as well as trainers and professionals representing a wide range of disciplines and approaches were involved: training institutions, training staff, social workers and researchers in contact with migrants and refugees, members of migrant communities, NGOs and volunteers organizations, policy makers, etc.